"Taking responsibility is not enough." Derek Fildebrandt is shown in Strathmore, Alta., Monday, Jan. 26, 2015. EDMONTON — A member of Alberta's new United Conservative Party has quit caucus after repeatedly making headlines in recent days for his conduct. "I have made honest mistakes — always doing what I believed was best at the time — and I accept responsibility, and am truly sorry," Derek Fildebrandt said Tuesday night in an email. "As media attention now passes from public issues to private issues, taking responsibility is not enough, and so I have submitted my resignation from the UCP Caucus to our Interim Leader Nathan Cooper." 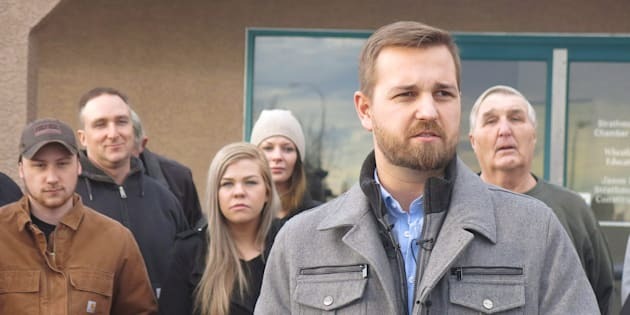 Last week Fildebrandt took a leave of absence from his job as UCP finance critic after news surfaced that he was renting his taxpayer-funded apartment out through Airbnb. On Monday he took responsibility for double-billing the government for some meals. On Tuesday the CBC reported that Fildebrandt was charged by Edmonton police last year with leaving the scene of an accident and failing to notify the owner of the damaged vehicle. Fildebrandt said he has worked too hard to help morph the Wildrose and Progressive Conservative parties together to allow his actions to shift the focus away from the UCP, including it leadership race. I'm a flawed man, and I can do better. "This young party cannot afford to be distracted from the formative period that it is in right now as we come together as conservatives. I owe that to my colleagues, my party members, my constituents, and all Albertans," he said. "Right now, media controversy is distracting from the work that must be done as the UCP is founded. The UCP Leadership race should be focused on issues of leadership and values, and not on personalities." Fildebrandt said he will strive to improve and will never stop fighting for Albertans. "I'm a flawed man, and I can do better. If I have let anyone down, know that I have let myself down, and I will prove that I am the man that I hold as the standard for trust and integrity." Derek Fildebrandt shares remarks during the Manning Centre Conference in Ottawa on Saturday, February 25, 2017. On Monday, UCP interim leader Nathan Cooper said Fildebrandt's expense claims were a concern and appeared to be part of a larger pattern of behaviour that is unacceptable for a member of the caucus. Cooper issued his own statement Tuesday night saying that he accepts his colleague's decision to step down. "Earlier this evening Derek Fildebrandt tendered his resignation from the UCP Caucus. I have accepted that resignation," Cooper said in a statement. "If Derek can live up to the expectations he has outlined in his statement, to the satisfaction of the UCP caucus and to Albertans, there would be consideration for a future path for him back to the UCP caucus." Fildebrandt, the member of the legislature for Strathmore-Brooks, has been a staunch and vocal critic of the NDP government's financial performance. He launched a group called United Liberty to advocate for the recent merger of the Wildrose and Progressive Conservative parties. The United Liberty website says he once served as the Alberta director of the Canadian Taxpayers Federation and led the fight against former Alberta premier Alison Redford government's deficit budgets and abuse of taxpayers' money.